Join Wild Birds Unlimited and Audubon Center for Birds of Prey Saturday, March 11th! While you are visiting, we hope you will also shop for a cause: Wild Birds Unlimited will be donating a percentage of their store sales to the Audubon Center for Birds of Prey in support of the Center’s raptor care and rehabilitation mission. Representatives from Duval Audubon will also be available. We'll cover the basics of native plant landscaping, where to find plants and examples. Alfred Romeu of Native and Uncommon Plants will provide a presentation on native landscaping and his services. Pete Johnson will present a native landscape project he completed with Alfred in 2016. Plants may be available for purchase, so bring some money if you wish to buy some. March 20th @ 6:30 p.m. for refreshments followed by the presentation at Swaim Memorial United Methodist Church, 1620 Naldo Ave., Jacksonville, FL. Asa Wright Nature Centre, in celebration of their 50th anniversary, will donate $100 to our chapter when you book a trip there during 2017 through Caligo Ventures. (Be sure to mention Duval Audubon Society when you book!) They offer guided group tours, independent birding ventures or relaxing lodge stays. 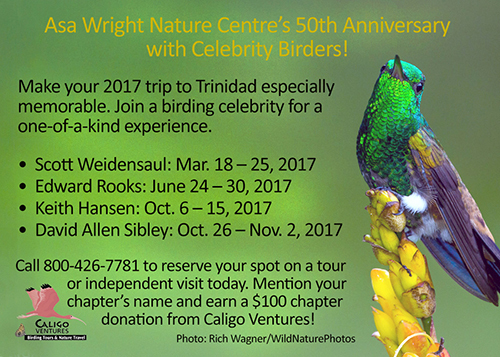 Special anniversary tours featuring 'birding celebrities' will be offered on select dates throughout the year. Go during one of these weeks or anytime during the year. For more information on booking your trip, go to caligo.com. Asa Wright Nature Centre has a rich history with Audubon. In 1967, visionary Audubon members rallied behind three influential people who had a dream. Renowned wildlife artist Don Eckelberry, prominent ornithologist and conservationist Erma Fisk and Russell Mason of Florida Audubon Society joined forces to make their dream become reality. Donors around the country helped them purchase the Spring Hill estate in the rainforest and the famous Oilbird cave thus creating the first non-profit, conservation focused trust and eco-lodge in the Carribean. Wild Birds Unlimited will host National Audubon Society's Avian Photography Exhibit March 6-16th! Visit the Wild Birds Unlimited Store at Jacksonville Beach in the South Beach Regional Shopping Center between March 6th and March 16th to view select winning photographs from the 2016 Audubon Photography Awards. Selected from over 7,000 entries—submitted from all 50 states, DC, and Canada—the winning photos were published in the May/June 2016 issue of Audubon magazine. A panel of five judges had the daunting task of sifting through the stunning images and grading them based on technical quality, originality and artistic merit. See if you can deciper what makes these photos winners!